Beginning in the Castleberry Hill Art District, named one of the top 5 Art Districts in the country, see iconic locations from your favorite super hero movies and television shows! Your tour starts right up in the middle of the Lagos, Nigerian African Market from Captain America: Civil War, past Rick's iconic horse scene on the bridge in The Walking Dead, past the Korean Church of Asgard from Spiderman: Homecoming, take a swing into the Capitol's Tribute Center from The Hunger Games, through Toyko from Avengers: Infinity Wars, and end up at the Avenger's headquarters all on this 3 hour tour. We even may swing by Korea in Black Panther. Your Insider guide has been on set so during the tour they have exclusive behind the scenes stories that you can only hear with Atlanta Movie Tours. Come and experience their world with stories of filming productions, how to become an extra, and what it is like to be in their world. Your knowledgeable guide provides insight into the filming process and gives you plenty of time for photo opportunities and rest breaks throughout your tour. Hear what happens on set and get a chance to show off your superhero knowledge during trivia - you might even win a prize! 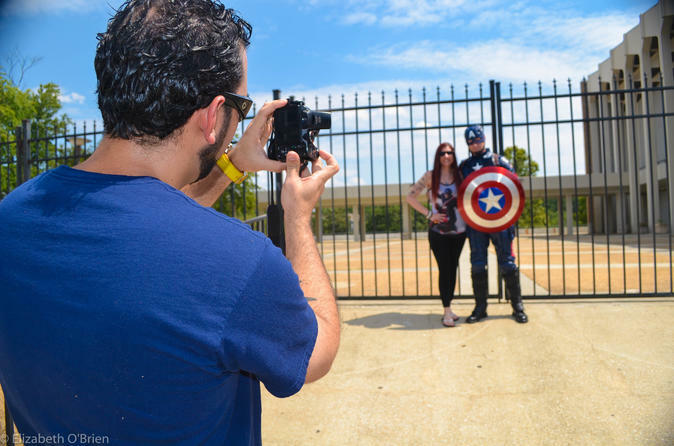 Plus, you get to meet fellow superhero fans and compare your favorite movies and characters. Ending back in Castleberry Hill, everyone gets a free commemorative photo to remember their day. Come see why people say we are the most unique Atlanta experience one can have in the city. Get in! Geek Out!